In previous Blogathons, I've asked for permission to publish new articles here. But after being overwhelmed with submissions last year, I've decided to do things a little differently. In the interest of running things a little more smoothly, I'll post any links to new or previously published posts on Ray. Send your contributions here, please. I am happy to accept entries from anyone. Of course, I don't have e-mails for every film writer or blogger. So I'm asking for aid in getting the word out. Even if you choose not to submit a piece, I request that you please help me promote this event at your own respective sites or on Twitter and Facebook. At top and below are JPEGs to help you market this. If you post one of these JPEGs or contribute a new piece to the Blogathon, please link either of them to this post. I hope all of you participate in some way. 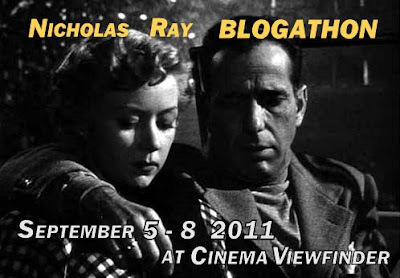 I'm absolutely participating & spreading the word as much as possible -- Nicholas Ray's a fantastic blogathon choice, especially because he's made so many great movies that get so little press. Plus he influenced multiple generations of great directors (Godard, Jarmusch, Wenders) and he's just flat-out one of the best directors of the '50s. Thanks, Andreas. I hope a lot of people get excited about the blogathon and no one is deterred by the fact that Ray is a director of classic cinema. How fitting you announce this blogathon on his 100th birthday! I'm in too. Deal me in, too, Tony...I had to bow out of last year Cronenbergthon but I'm definitely going to contribute something for this one. Ivan, I look forward to readingyour contribution. I had a great time being part of your Cronenberg blogathon. So I would be happy to participate in this as well. I'm actually sort of ignorant of Ray's work. Any suggestions for placing start, and films to write about? Looking forward to it. Er, I meant "places to start." You know I'm in, but just to clarify: post anything new to our own sites first and send links? No more sending in posts for you to publish first? We had talked about this on Facebook already, I'm doing something for Ed Copeland on Ray (a two-post retrospective on my favorite moments), and I would love to either expand on one of the films I talk about in that post or submit the link to what I wrote for Ed. I'll probably do both! I'm really looking forward to what people have to say about his work since I just watched it all -- especially his later, not-so-popular films. I hope someone tackles THE SAVAGE INNOCENT. Anyway, great idea, Tony! Sounds like another sure-fire win for your Labor Day blogathons. Others might want to join in to suggest additional Ray films, but here are titles I consider essential: THEY LIVE BY NIGHT, IN A LONELY PLACE, ON DANGEROUS GROUND, JOHNNY GUITAR, BIGGER THAN LIFE, and, of course, REBEL WITHOUT A CAUSE is the best entry point. You are correct. Just send me a link. Of course, if you're writing something new best to hold off on posting it until closer to the blogathon dates: 9/5 - 9/8. Do as much or as little as you'd like. But I welcome anying you contribute. Look forward to reading all contributions! Count me in for a contribution! Love Ray's work and it gives me a chance to write about older films - something that I don't do enough of! I'm in. I posted about it on my FB page. Tony, I followed your link from Ivan's blog - I love Nicholas Ray and would really like to participate. Could I do The Savage Innocents? I have always loved that movie, and seemed to me to be an unusual choice for Ray. But then, he was an unusual man! Are you going to assign certain days and movies? And it sounds like you want participants to post on their own blogs and send you the links to post here at blogathon time, correct? I'm looking forward to it! Oooh oooh oooh -- colour me excited. Rebel Without A Cause, Bigger Than Life, They Live By Night, On Dangerous Ground, In A Lonely Place, The Lusty Men, Hot Blood, Johnny Freakin' Guitar. I guess what I'm saying is -- count me the Hell in. And I just posted about it at my blog, The Most Beautiful Fraud in the World. Happy to have you both onboard! You can choose any movie you'd like. And you just need to send me a link, but I'd probably wait on posting your piece until the dates I mentioned above. Look forward to reading anything you contribute. SAVAGE INNOCENTS is a good one since it's so hard to find. Glad to hear from you again. Thanks for promoting it at your blog. Can't wait to read whatever you contribute. I currently have an interview with author Patrick McGilligan whose new bio is on Nick Ray, posted at my website. I also just finished and will be posting a review of THE LUSTY MEN this coming Friday. Both are available for the blogathon. I will e-mail links. looking forward to this! Though the timing isn't ideal for your blogathon - most of Ray's filmography will be airing on TCM throughout October on Tuesday evenings - included are a few harder to find on video items. Your interview with Mr. McGilligan would make for a nice entry, thanks. Sorry, the timing couldn't be helped. October is usually busy around here with my coverage of the New York Film Festival. I hope it's okay but I designed my own banner to promote your wonderful blogathon. I couldn't resist having one with Johnny Guitar involved. awesome. I would LOVE to participate. I would like to participate. I only occasionally write about film on my blog, but Ray has so many great crime films to pick from that it would be an excellent reason to re-watch any of them and write something to honor his 100th b-day. Tony - It's been a while since I've been blogging, but I'm in the process of consolidating and getting back into the game, and will definitely be participating - IN A LONELY PLACE has fascinated me since seeing it as a young kid, and the chance to revisit and write about it is just too good to pass up! I will be seeing ON DANGEROUS GROUND this coming Saturday night at Manhattan's Film Forum as part of the currently running two-week long Robert Ryan Film Festival. Of course like just about everybody else including yourself I've seen this film many times over the years (it's a personal favorite)but it's always a treat on the big screen. However, more significantly, especially for Ray completists will be the single showing on Sunday, August 21 at 4:30 P.M. of the rare "Born To Be Bad", a title that hasn't even received a DVD release. I will be there with my wife, and hope to able to make some kind of valid contribution to your great project in some way. Cinema Fanatic and John, I look forward to your participation. Sorry to hear about your inactivity in the blogging world, Chris. I thought I hadn't seen you around. But I look forward to whatever you contribute on IN A LONELY PLACE, one of my very favorite Ray films. Sam, welcome back. I hadn't read your distinctive writing around these parts in quite a while. Hope you do find time to contribute to the blogathon, if only to hear your thoughts on one of the Ray rarities, BORN TO BE BAD. I'm jealous I missed it in NYC, but I think I found an alternate venue in which to see it, hee hee. Already post the news on my blog! I'll absolutely be in the game... Thanks Tony! Just stopping by to say that I'm looking forward to participating in your Nicholas Ray blogathon with a post on one of my favorite films noirs, "They Drive By Night." I've been tweeting about the event, and will be spreading the word on my FB site as well. Can't wait! Dottor SINema, thanks for joining up. @Karen, I've caught your tweets, so thanks for helping to promote the event. Look forward to reading your post on one of my favorite noirs. Thomas, a post on either of those films would be welcome. I wrote one up myself for BORN TO BE BAD and RUN FOR COVER, but the idea is to get cross-section of opinions on Ray and his films so the more the merrier. Don't know anyone who's doing A WOMAN'S SECRET (or THE HIGH GREEN WALL...I'll give extra credit for that one). To all commentors, if you haven't sent me any links for previously published posts, start sending them today. And send links to new posts as soon as they go up between tomorrow and Thursday. My piece probably will not be ready til Tuesday. Is that still okay (since it is between the dates listed)?